You'll find most of us online tonight playing ODST! 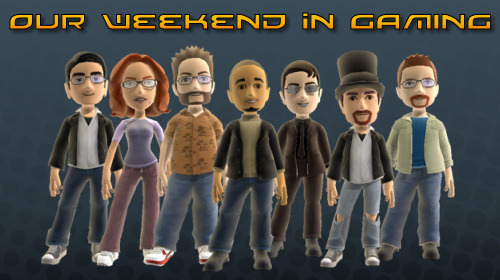 Other than that there's a nice variety of gaming goodness going on this weekend. Nick "bapenguin" Puleo - "My weekend will be dominated by Modern Warfare 2 and Dragon Age Origins. Did you hear that Mike? I'm finally going to play Dragon Age!" Marc "DjinniMan" Allie - "I'll be playing Spyborgs and some Guitar Hero Van Halen. And wishing it was next Tuesday for Left 4 Dead 2." Mike "pheriannath" Katsufrakis - "Twenty hours in, and my Dragon Age completion stat is sitting at a mere 16%! I think I know what I'll be playing!" Jim "txshurricane" McLaughlin - "For me, it's tons of Modern Warfare 2, plus a run-through of Star Wars The Clone Wars: Republic Heroes. Oh, and I plan to jump in for tonight's Halo 3 ODST Firefight Co-Op Night!" Katrina "ShadokatRegn" Pawlowski - "Uh, no Dragon Age or Modern Warfare 2 for me. I'll be finishing up Batman: Arkham Asylum, and probably playing more Batman after the story is done. Then, Borderlands will be revisited before the DLC is available." Jason "OrigamiPanther" Love - "Investigate, investigate, investigate, ASSASSINATE! story, rinse, repeat. Yep, catching up on Assassin's Creed before the next one comes out. Also, some Firefight tonight and maybe some more Torchlight." Loren "AgtFox" Halek - "Playing Ratchet and Clank: A Crack in Time, possibly Modern Warfare 2. Do not have time for Dragon Age though, that will have to wait until December probably. " Page created in 0.5800 seconds.